To get usable results from this test, your milliammeter has to have a resolution of at least 1 mA, and 0.1 mA or better is perfect. 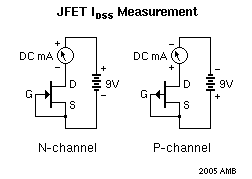 I recommend that you use a current-limiting power supply for this test because it's very easy to short the milliammeter across the power supply with a simple slip of the probe; if your power supply is capable of putting out more amps than your meter can handle, you'll blow a fuse in the meter. (Or if it isn't fused, you could destroy the meter!) DMM fuses are expensive and hard to find, so you don't want this to happen. Once you have your breadboard set up for testing transistors, I recommend that you test a whole bag of them at once and keep them sorted somehow. That way you only have to do the test once, and then later you can pick matched Q1/Q2 pairs quickly. One way to keep your transistors sorted is to put them on a strip of tape, folded over the heads of the transistors, similar to the way some resistors and diodes come packaged. Masking tape works well for this. Another way is to get a small fisherman's tackle box, and use each compartment to hold parts within a small IDSS range; the kind with lots of small compartments works best.